Details about Sea of Thieves first free DLC update “The Hungering Deep.” have been released, as well as a new trailer. The update will contain a large sea creature that is supposedly worshiped by some characters as a deity, that can be encountered by players. 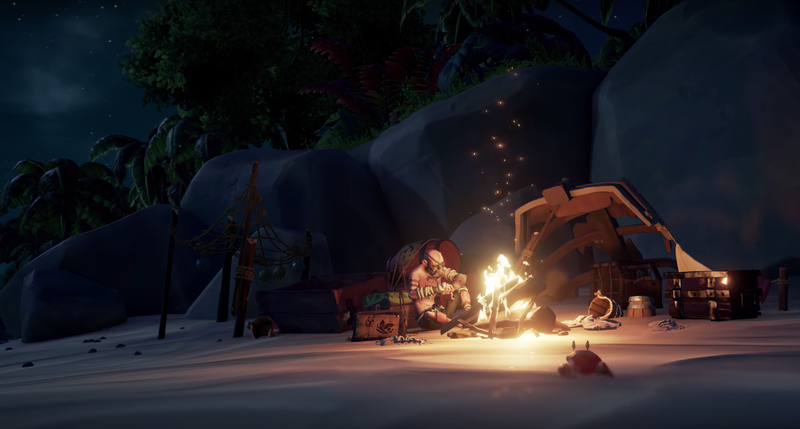 There’ll be a limited-time quest where you’ll follow the trail of “Merry Merrick”, and the update will include new items like drums that will contribute to playing sea shanties, “Speaking Trumpets” which will be used to contact faraway players and a variety of flags for your ship. There will also be new tattoos and scars to place on your character. Best of all this DLC is coming as a free update for all Sea of Thieves players on May 29th. Sea Of Thieves is available on Xbox One and PC, and has a metacritic score of 69 (Xbox One) and 66 (PC). Are you looking forward to The Hungering Deep? Have you played Sea Of Thieves? Join the discussion below.